Vehicle wraps are one of the best ways to promote your brand, increase visibility, and add uniformity to your business vehicles. Attractive, cohesive wraps not only serve as a constant advertisement, they also build customer confidence in your brand and in your company representatives. 303 Sign Company is a local, full-service vehicle wrap provider, handling everything from creative wrap design to flawless installation. Turning your vehicle into a mobile advertisement for your company means a huge increase in visibility and exposure for your brand. However, getting a wrap just right, including the proper messaging, layout, and installation, takes the work of professionals. You want your wrap to reflect the professionalism of your organization. An improperly installed, unattractive, or simply ineffective wrap can say just as much about your business as a good one, making expert installation a vital part of the overall effectiveness of your new marketing tool. At 303 Sign Company, we handle the entire process, delivering a compelling and professional wrap that works hard for your business, and looks great while doing it. Many businesses find that they use a variety of vehicles to perform work functions, such as delivery vehicles, personal cars for executives, large trailers for over the road transport, or box trucks for small in-town jobs. You may have service vans, work trucks, even lawnmowers that can benefit from professional branding. 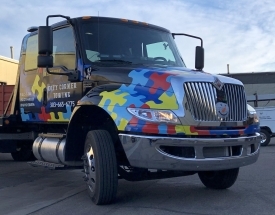 The obvious benefit of applying attractive, cohesive wraps to all of your different work vehicles is brand recognition and increased visibility, however, that isn’t the only benefit. A branded fleet vehicle also positively impacts customer perception, improves brand loyalty, and creates a customer or client that is more likely to leave you a glowing review. Customers are looking for validation and reassurance. Everyone is nervous when someone knocks on their door. Even if they are expecting you, the arrival of a stranger at their home will put just about anyone on edge. However, with branded vehicles and a uniform to match, the client will instantly feel more comfortable and confident that it is an actual representative of your company that is there to assist them. Not everyone wants or needs a full vehicle wrap for their business. It may not suit your brand personality or may simply not fit your budget. That doesn’t mean that you can’t still benefit from the increased visibility a branded business vehicle provides. We provide multiple options for vehicle branding, and will assist in determining what is the right course of action for you, your vehicle, and your brand. A full vehicle wrap provides complete, seamless coverage for your vehicle, allowing you to effectively turn your vehicle into a traveling advertisement. You can put any design elements, colors, images, or messages you want on your wrap, and our expert designers can create an attractive layout that complements your vehicle and brand. This provides the maximum in visibility, allowing your brand to truly shine, and for your message to stand out. Your marketing message will not only encase your vehicle, it also offers a layer of protection from road wear and elements, making it the ideal choice for vehicles that get heavy use, especially during our Colorado winters. We use premium vinyl, suitable for applications ranging from deep snow to speed boats. If you want the look and seamless feel of a total wrap, but don’t need quite that much coverage, then a partial wrap may be the right choice for you. A partial vehicle wrap can focus on one specific element of your vehicle, such as the hood, tailgate, or side door, or can flow across a portion of your vehicle, such as from the back up to the front doors, but with no coverage on the front panels or hood. We can work with you to determine the right coverage amount for your desired design, and we always work to produce our wraps as efficiently as possible, as to not only minimize waste, but also ensure we are providing the best possible price. Looking for a single graphic element, need vinyl lettering, or just want to add your logo and basic information to a door panel? Cut vinyl graphics are individual elements that can be applied to your car, instead of the full sheets of vinyl that partial and full wraps use. This can also allow us to maximize our materials, providing you with a cost-effective solution that is also versatile, and easy to update or remove as needed. Regardless of the type of vehicles you use for your business, we can create attractive, brand reflective vehicle wraps that assist with promotion or identification. Commercial fleet wraps allow you to provide a consistent message everywhere your brand is seen, whether on your storefront, on the road, or assisting clients on location. 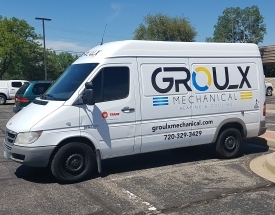 Businesses that can benefit from attractive vehicle wraps and graphics include independent contractors, landscapers, electricians, builders, roofers, plumbers, pool maintenance, repairmen, installation teams, food trucks, and delivery vehicles. Businesses without traditional storefronts, such as internet retailers or brand ambassadors can also find that they benefit from the increased exposure an attractive and well- done wrap can provide. We not only provide vehicle wraps and graphics, we are a complete sign manufacturer, creating all of the signs your business or organization needs for promotion and identification, including outdoor signs like storefront signs and monument signs, as well as indoor signs like lobby signs and ADA signage. Whatever your signage needs, we are here for you! We offer complete commercial vehicle wrap services, and can provide assistance throughout every step of the wrap process. A locally-owned Boulder business, 303 Sign Company prides itself on providing creative design, attentive production, and expert installation for all of our signage products. In order for a wrap to be effective and impactful, we must first understand what message you want your wrap to send. This should be a concise explanation of who you are and what your business does, and can be accomplished in words or pictures. We take that branding message, along with your business information, and design a completely custom vehicle wrap, specific to your vehicle type and color and design preferences. Once we have a design we are happy with, we will create a “mock up” showing what your final wrap will look like once installed on your vehicle for you to thoroughly review and provide feedback or edits, and ultimately approval. Once your design has been approved, our expert vinyl wrap fabricators will construct all of the individual vinyl elements needed for your wrap, ensuring that everything has printed properly and is free of defects. This is handed over to our professional wrap installation team, who will prep your clean vehicle for installation before expert installation. Once your wrap is installed, you are ready to hit the open road, promoting your brand everywhere you go!